Precise measurements will save time and money! You can measure as good as any professional in the business. Want to estimate your flooring project? We will show you how and give you some simple tips on how to measure your flooring needs so that you won't be over sold by anyone. Allow 5-10% extra for waste depending on the product you choose. This is the typical industry standard, however, keep in mind that longer planks usually have more waste. Use basic simple methods to measure your rooms. In the image we have made it real easy by turning everything into squares and rectangle. Make sure you round up rather than round down your numbers. It is perfectly ok to have a few extra pieces at the end of the job for future use. 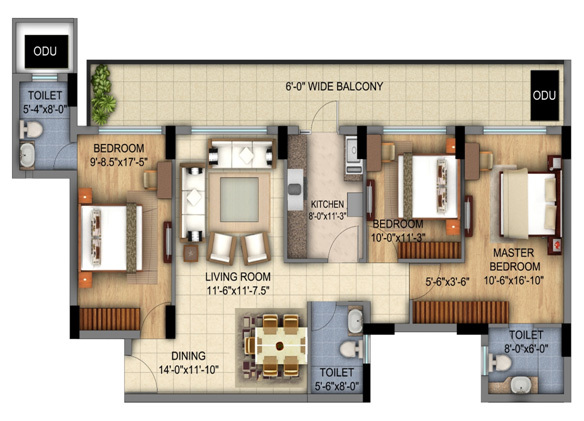 In the figure, Master bedroom should be measured at 11X17, living room should be measured 12X12 feet. Any odd size rooms should be converted to multiple squares and rectangle and each measured separately, then added up. Choose a good time of the day to measure and allow enough time for details. Avoid speaking to anyone while doing the measurement to reduce the risk of making mistakes. Based on our experience, customers tend to measure low, make sure you throw in a fudge factor or are generous with your measurements. Remember there is always a 5-10% waste factor that needs to be added. Also, do not forget about closets. It is better to over-estimate and avoid shortage in the midst of installation! Feel free to contact us if you need help. Wood floors have become very popular in the kitchen areas, even though chances of damage is slightly higher in the kitchen than other areas of the home. Start from the most open area of the kitchen. Do not forget to account for areas under the Refrigerator, Stove, Dishwasher, Wine Cooler and/or other appliances you have in your kitchen. Special attention must be given to Dishwasher if you choose to pull it out, often they are bolted or locked in the back. You may have to disconnect and reconnect the Dishwasher by a professional after the floor is installed. In the case of engineered products we recommend installing wood under the appliance, but in some cases it may not be possible or needed. In some existing kitchen, dishwashers are installed directly on the concrete and the height is adjust via front legs to match the hardwood flooring. This is a personal choice. As mentioned before, please allow for waste and round up rather than rounding down your numbers. If you are ordering matching materials note that some pieces may not be exact match since the wood characters vary from lumber to lumber, eventhough the same finish is used. Most Trim pieces come either in 72” or 78” long. Different sizes are also available. Make sure you know what sizes you need. Most doorways could measure up 28-36 inches while other custom doors can measure up to 72 inches. Remember you have matching quarter round, shoe and base molding which are measured in linear feet. Wood floors are not recommended for laundry rooms and full baths, however transition pieces are required at the entrance to these rooms. Please account for waste in transition pieces. You should consider transitions to be in one long linear piece rather than multiple pieces. We want to avoid as much breakage in transitions as possible. Smaller peices of transition will be used in smaller and hard-to-see places such as closet spaces. It is often difficult to find the same material few years down the road. Most manufacturers in order to introduce new products to the market, are often forced to discontinue older product lines that are no longer in demad or profitable. Sometimes the manufacturing process chnages over years and causes variation in the final product that may not match previous years productions. It is a good practice to order a few extra pieces and store them for future use. Typically if you have straight forward installation a 5% waste should be added to the total estimate, which is the industry standard for wood flooring. With larger planks, parallel walls, odd size rooms with 45 degree angles, the waste factor should be increased to 7-10%. If you do not like variation and are very selective about wood characters, stay with 10% waste factor.